The new (2nd generation) Honda Fit was just launched in Japan for the JDM in October during the Tokyo Motor Show. This amazing little car will now be making its way outside of Japan and to the rest of the world from next month onwards. For Asia, it will continue to be called the Honda Jazz and will be launched starting in Thailand and thereafter across the rest of Asia next year. This new Fit comes with either of two 'new' engines, actually a development of the engines that powers the outgoing 1st generation model. They are the 1.3l L13A SOHC i-VTEC and the 1.5l L15A SOHC i-VTEC. The new L13A has discarded the i-DSI technology in favour of i-VTEC and delivers the superior low-rpm torque of its predecessor along with a lot more power in the high rpm range, as well as enhanced fuel economy in everyday driving. It is now 16-valves in configuration, still SOHC but features enhanced intake performance and DBW (drive-by-wire) and delivers a max power of 73kW (100ps), 14ps or 16% more power than the outgoing L13A i-DSI. Using the 12V/16V VTEC implementaion and new ECU tuning helps it deliver this max power along with a class-leading 24km/l in fuel economy (Japan 10.15 rating). 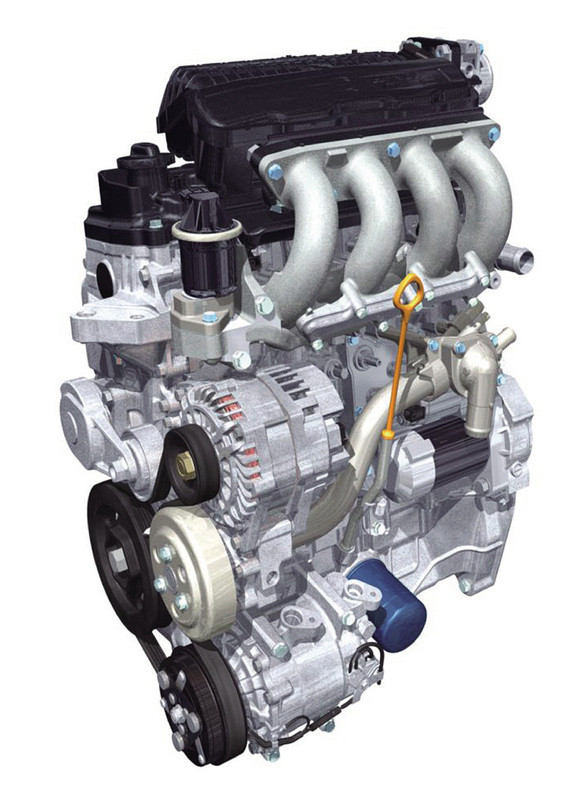 The new 1.5l L15A SOHC i-VTEC delivers superior fuel economy combined with good torque throughout the rpm range. Using the 'power SOHC VTEC' technology first used on the D15B engines of the 5th generation (1991-1995) Honda Civics, it now delivers a max power of 88kW or 120ps, 10ps or 9% more power than the outgoing L15A SOHC VTEC. Along with this, it still delivers a fuel economy of 19.6km/l ! The CVT gearbox too have received important enhancements. It now features the use of a torque converter and offers better off-the-line acceleration. It is yet unknown whether it still retains the use of the infamous 'start-up clutch'. The CVT gearbox have revised gear ratios for better performance and also improved fuel economy during cruising. A new low-friction, high efficiency oil pump and CVT pulleys plus a new creep control system (implemented via ECU programming) provide optimized 'creep control' at low speeds and during idling for improved fuel economy. This short technical overview is written using the materials found in both the Honda Fit page on the Honda website for the Japan Domestic Market (www.honda.co.jp) as well as materials from the Honda Motor Co. Ltd resource page for media. The translation from the japanese languaged materials have been done on a best effort basis. As with the new format for our technical overview articles, the actual technical materials in this article will be published in watermarked JPG formt, to enforce copyright on this review.